I think most of you by now will be aware that position in poker is very important. How important? Well its everything, especially when playing against winning players. I have written other articles on the topic, specifically talking about it in a cash game format, however I feel like there’s more stuff to be said about playing in position and out of position in MTT tournaments where stack sizes tend to be a little bit more shallow. First of all, when you have fewer than 25 big blinds there should be very few if any situations where you call a raise out of position. 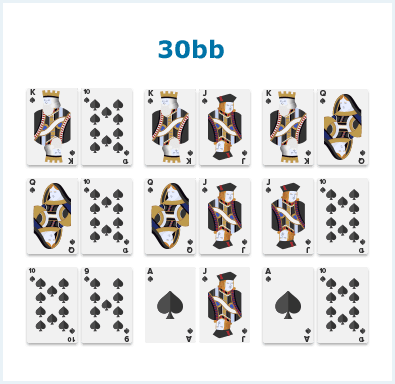 An acceptable example might include calling a preflop raise with a small pair 3 or 4 way with a 25bb stack in hope of hitting a set and doubling up pretty often when you do. But with stacks lower then 20 bb you do not have the odds to call to set mine even if its 3-4 ways to the flop and your closing the action. For the most part, when you have a stack below 20 big blinds you want to always be shoving allin over a raise and never calling. At some point there is an imaginary line where shoving allin over a raise becomes a rather large overbet and not optimal. This is usually around the 20-25bb range. At this point you have a few options of what you can do, if your hand is too strong to fold but not strong enough to get allin preflop you can flat, against a late position raise and roughly 30bb stacks I would consider a good flatting range out of position to be: KTs KJs KQ QTs QJs JTs 9Ts AJ AT. With your stronger range of hands that you want to get allin preflop, for example mid/big pairs, AQ AK I would not make a massive overbet preflop. I would just make a large 3-bet (since we are out of position I would 3bet to 3.5-4x there open raise) and then shove in on the flop no matter what. If your worried about balancing whilst playing against good regulars, just shove allin with aces on the flop. flatting range because my opponents' range is stronger. When stacks get even deeper than that you have to make your value 3-betting range smaller, since there allin range will be tighter, consider adding hands like AQ and TT to your flatting range when you are 40bb+ deep even in steal situations. When you have a 40bb stack its disastrous to 3-bet preflop, continuation bet half pot and then fold to a shove losing around 40% of your stack in the process, so try not to do that. Another example that may be considered acceptable and profitable is called the “stop and go play”, its very well known by now and most of your opponents will know what your doing. What a stop and go is, you call a raise from the blinds and then shove your stack in on the flop no matter what the flop is. The idea behind it is to try and create some fold equity postflop where it doesn’t exist preflop and is usually done when you have a pretty short stack. Doing this its often a bad idea because you will often have very little fold equity and your opponent will be calling you with a very wide range, in most cases I recommend that you just fold your hand preflop if you think you have no fold equity and are behind your opponents raising/calling, the chances are if you have no fold equity preflop you will have very little postflop. This is best tried against tight players postflop who will fold hands that miss the flop and hands like ace high to your allin shove. Finally, another sneaky little play id like to contribute is the preflop slowplay. This is ideally used when you feel like your opponents range is wide and will be folding alot to your preflop 3-bet almost always. This is often the case with late position steals from tight aggressive regulars, also, these regulars may continuation bet the flop automatically. What you do is flat a monster hand like AA or KK preflop and check the flop to induce the continuation bet, once they do, you can checkraise the flop. This works with a multitude of stack sizes because if the flop isn’t a checkraise allin, you will be able to shove the turn allin. 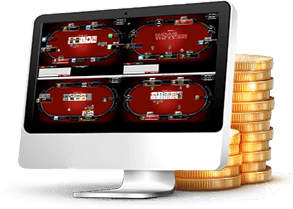 Remember, against early position raisers, they are likely to have a stronger hand range so your more likely to get action with your preflop re-raise. Also, its not good to do it multiway, this works best in headsup pots, the more people to the flop, the more likely your hand is to get cracked, its also worth noting that when you squeeze it looks like you could be stealing. The final benefit is that you might get paid off pretty light, a player could be raise QT preflop and planning on folding to a shove preflop, however, when the flop comes down Td 4h 5d and you shove over there continuation bet, there gonna have a real hard time getting away from the hand and you will most likely take there stack. On the flip side, situations that are good for slowplaying preflop because you have so much fold equity are great for re-stealing. In spots like this, if you have a re-stealing stack you want to be leveraging it to full effect and gaining the dead money. Cliffnotes from this article for the lazy! 4Re-stealing is best against tags with high fold to 3-bet %. 5Re-stealing is not good against fish or calling stations. 6The stop and go play can be used to create postflop fold equity that doesn’t exist preflop. 7You can flat out of position with a wider range against late position opens than early position opens. 8You can slowplay monsters preflop if your opponent will always fold to a 3-bet.